This old warehouse in Melbourne has been many things from jam factor to advertising agency to aerated water factory to engineering consultancy. Now it’s a home. Designed Andrew Simpson Architects for the extended family this modern home contains pockets of space within the building each making a house of its own. To enhance natural lighting and ventilation the operable skylights were installed into the building’s original ceiling with preserved trusses. Bedroom, bathroom and laundry are all divided with sliding panel doors while the public area with the open plan kitchen and dining is enhanced with glazed walls that open up to an outdoor area with its own kitchen island. The area has a wall of exposed brick that contrasts very nicely with the main white color scheme and contrasting black beams. The old brick of the exterior has also been preserved and makes a nice contrast with the sleek dark door and window frames. The conversion shows why spacious industrial buildings are so perfect for creating living spaces. You can play with the layout, create rooms and areas of desired sizes, and creatively solve various problems, which becomes a unique part of design. 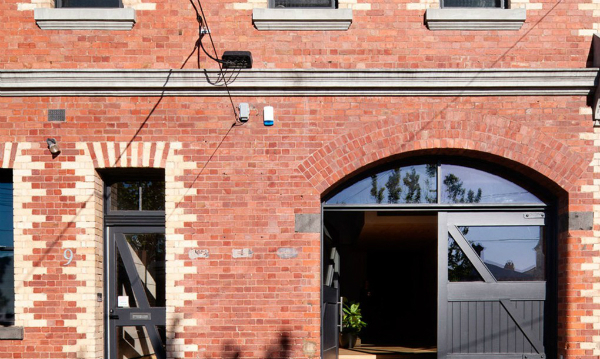 See another 5 great warehouse conversions in various styles and cities of the world.